Those with fibromyalgia and chronic pain know all too well the challenge of exercise. Their often undiagnosed or misdiagnosed condition leaves them in near constant pain and fatigue. For the nearly 10 million people who suffer from this condition, the thought of any movement can be overwhelming. What makes yoga perfect though is that it can be adapted for each person’s individual needs. Additionally, yoga’s ability to calm the mind and reduce stress may also serve to reduce the main trigger of fibromyalgia attacks, as well as slowly loosen cramped muscles. Here are eight yoga poses for fibromyalgia sufferers. Child’s pose allows you to turn inside and quiet the mind. Because of the nature of the pose, outside stimulus is eliminated, allowing you to focus on your breath. If you’re up to it and want a bit of a stretch, you can work on slowly rounding your back or reaching your arms forward to stretch the shoulders. 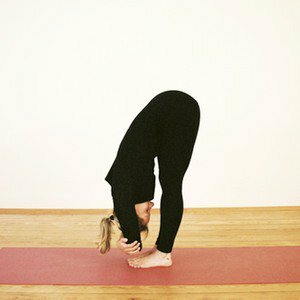 Considered the most gentle of inversions, this pose works in the opposite direction of our typical upright posture, allowing the muscles of the hips and legs to stretch and relax. Because you’re flipping the way gravity is working against blood flow in the legs, this pose can reduce swelling and fatigue in the lower extremities. If you find this is challenging, placing a bolster or folded blanket under the hips may help. 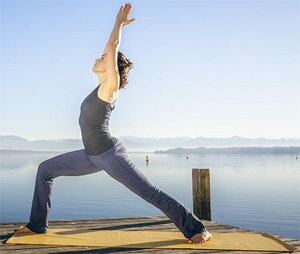 To the non-yogi, Mountain Pose may look like simply standing, but when attention is given to grounding into the earth, drawing the shoulders down the back, and lengthening the spine and breathing, you’ll feel your stress decrease, along with a relaxation of your muscles and organs throughout the body. This is a wonderful posture for the calming effect as well as the opening it provides across the entire back of the body, and depending on your degree of pain and flexibility, it can easily be modified. If this feels too challenging, place your hands on the wall and use it as a support until you’re able to place your hands on your thighs comfortably. 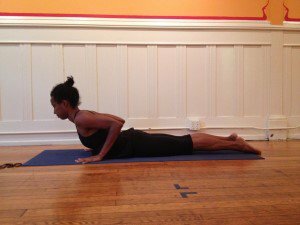 This concluding posture can be done at any time as a way to quiet the mind and relax the body. More than just lying down, Savasana teaches us to ignore outside stimulus, accept where we are, and simply be in the moment. It also allows the muscles and organs to simply relax and return to an easy state. Cobra helps to open the chest and front body as well as strengthen and stretch the back—both of which can be highly sensitive areas for sufferers of fibromyalgia. 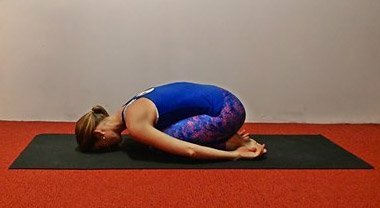 You’ll want to ease into this pose and start by just placing your palms alongside your chest and breathing with your forehead still on the floor. It’s important for fibromyalgia patients to also keep muscles strong, and Warrior I is a great way to do that while also calming the mind. This traditional posture strengthens the big muscles of the legs along with the back and arms. This is great pose for opening the hips and strengthening the knees and groin. It may be challenging at first, so if all you can do is start with your legs extended in front of you and slowly open the hips and bend the knees and breathe, that’s ok. The goal here is to quiet the mind and find a bit of relief from your pain.